Get ready to get Rexxed! On Friday, October 6 at the Perth Convention Centre, Perth is finally getting what we never knew we needed – the opportunity to go back, way back, and get all cretaceous up in here. Who doesn’t want to drink and get down with 23 life sized animatronic dinosaurs? 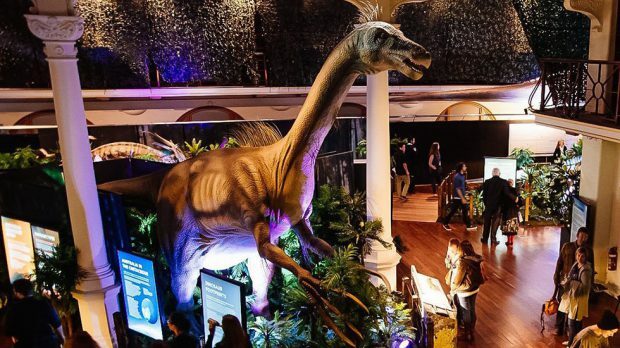 The WA Museum is hosting a party of prehistoric proportions called Dino Disco, among the currently showing Dinosaur Discovery exhibition at Perth Convention Centre, with drinks, DJ, and dino sized fun and games. Featuring the fine folks of Museum Hack and Dustin Growick from The Dinosaur Show, there will be a feast of creature features including exciting augmented reality, sand pit excavation, and an assortment of special challenges for the night, including dinosaur selfie challenges, trivia rounds, scavenger hunts, and spot talks with the museum’s resident palaeontologist. The Jurassic vibes get turned up after 10pm, as the DJ kicks it into mammoth mode and guests throw neanderthal shapes, get on the floor and everybody walks the dinosaur. Get on it! Dino Disco takes place at Perth Convention Centre on Friday, October 6.